Majili will remain to be a very special film for both Naga Chaitanya and his wife-actress Samantha. The film directed by Shiva Nirvana has entered profit zone in first week itself and it is expected to end as biggest hit in Chay’s career. Naga Chaitanya indeed took the film prestigiously as he liked the script to the core. He had undergone a makeover to play a middle aged guy in the film where he played the role of a cricketer. Meanwhile, Natural Star Nani who is in desperate need of a success is coming up with a sports drama film Jersey directed by debutante Gowtham Tinnanuri. The film’s theatrical trailer was released yesterday and many opine the plotline is very much similar to Majili. But, they are completely wrong. Majili is set around the premise of love, heartbreak and cricket. The story revolves around an alcoholic and a failed cricketer whose wife takes the responsibility to nurse an emotional trauma caused to him by a failure love story. 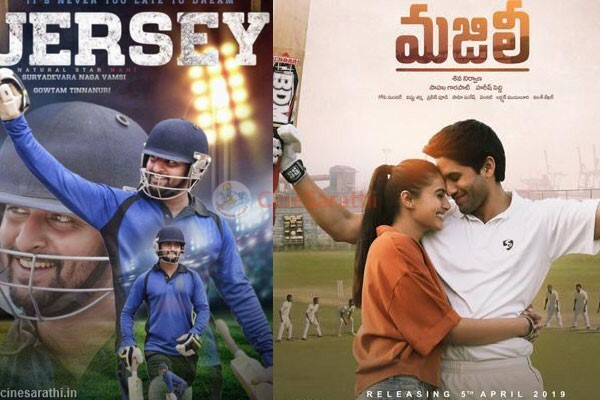 Coming to Jersey, the premise is completely different from Majili, except for the fact that, protagonists in both the films are cricketers. Going by the trailer, Jersey is about a failure cricketer who makes his comeback to playing cricket for his son’s future and also to realize his life ambition. Nani marries the same person whom he loved during his younger days. But, Shraddha Srinath is a modern day wife who doesn’t pamper or encourage her hubby or the son because she is the only earning machine in the family. In one word, the personality of the protagonist and the emotion in Jersey are completely distinct from Majili.